"The Official World Famous Monsters"
Since the early forties, people have been frightened by the famous monsters of Universal studios. Frankenstein, Dracula, The Mummy, Wolfman and the Creature from the Black Lagoon, have all kept us from getting a good nights sleep. Only one toy line has ever been able to capture their likeness, The Official World Famous Monsters. The figures were made by Azrak Hamway International (AHI) between 1973 to 1976. AHI designed six different monsters based on the Universal Monsters of fame. The figures produced were: Frankenstein, originally based on Boris Karloff's portrayal, Dracula, Wolfman, The Mummy and two different Creatures from the Black Lagoon; one female and one male. The first of each of these figures was designed from the Aurora Models created in the previous years. The variations followed afterwards. Most guides and information will document two to five different and significant variations to all of the figures. From different colored plastic bodies, to different shaped hands, to completely changed head sculps. What you might not know is that there are many more variations to the line. The production sequences and assembly lines of toys in this time period were very lax. In some cases the dolls were attached to cards with different shoes, different heads, etc. The size of the figures ranged from six inches to eight inches. The backer cards fell into this same group. Different prints, changed artwork, all play a part in the many variations in the line. Take under consideration that these six monsters were being produced for three consecutive years. The best part of the differences is that each captures the horror of the actors that played the parts in film. Each are well detailed, from the cloth costumes, plastic shoes, to the fake blood on the Mummy. Overall, with so many variations, it is easy to find a different addition to your collection, rarely duplicating one you might already have. 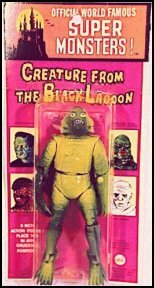 The rarity of the figures in the line are topped by the male, wide-waist Creature from the Black Lagoon. The Female or thin-waist is a close second. The others in the line are about equal in rarity. But in the end they are all extremely difficult to find in good condition, not to mention complete. To find them on card is also a rare treat. Dracula was the only figure boxed in the series, the other figures were never boxed, only carded. The artwork was similar to the artwork of the Aurora model kits of 1972. The later artwork featured small head shots of the other monsters in the series. Universal Monsters will always be a part of our culture, it is our enjoyment of the toys, and the memorabilia that keeps our love for the Horror stars. AHI luckily captured the essence of the Monsters of Film. Many others have attempted to duplicate the uniqueness of the line , but none have succeeded.